" /> 2018 Chrysler Pacifica Highland MI | Szott M59 Chrysler Jeep " "
The 2018 Chrysler Pacifica was built for your family. It will improve your drive in Highland, MI and beyond. See the Pacifica at Szott M-59 Chrysler Jeep today. Do you struggle to fit multiple car seats in your sedan? Do you wish there was an easier way to take kids and gear to your destination at the same time? Maybe you wish that cleaning your car was easier. Your wishes have been granted! The Chrysler Pacifica was built with your family in mind and we are proud to offer them to you at Szott M-59 Chrysler Jeep. Imagine if you owned a vehicle that gave your family the flexibility they need to make your drive more manageable. If you choose the Chrysler Pacifica, you get the flexibility you need to take kids and cargo at the same time. You can opt to seat up to 8 passengers at the same time or choose from the 243 various configurations that allow you to choose a combination of cargo and passengers so you can take what you need to along for the ride. The great news is that you don’t have to remove the seats because they fold neatly into the floor below, making it easy to have all the room you need for your road trip or soccer game. Third-row passengers will appreciate the Easy Tilt second-row that makes access to the rear row easier than ever before. Mom and dad will love the heated and ventilated seats that let them control their cabin comfort. When your tots make a mess, you don’t have to fret. The Stow ‘N Vac makes clean up a breeze and stretches throughout your vehicle. Let us show you these features at Szott M-59 Chrysler Jeep today. Any parent can tell you that without distractions to keep your little ones busy, a road trip can quickly become a distraction. The Chrysler Pacifica has you covered with the features you need to keep them busy for miles down the road. The Uconnect Theater gives your little ones dual 10.1-inch HD touchscreens with Blu-ray player and dual HDMI inputs, as well as wireless headsets, wireless streaming, and Bluetooth remotes. It also offers games and apps that can distract your little ones for hours. “Are we there yet?” will be a thing of the past and parents can relax. Mom and dad can use Apple CarPlay and Android Auto to stay connected to the outside world. With the sound of their voices, they can get directions, stream music, send and receive text messages, make and receive phone calls, schedule reminders in their calendar, and more with Bluetooth hands-free technology. Get a demo today at Szott M-59 Chrysler Jeep. Your Pacifica Is Calling, Will You Answer? Szott M-59 Chrysler Jeep is your one-stop shop for the Chrysler Pacifica. Your Pacifica is oh so lonely and waiting for a new home. Won’t you answer the call and adopt one today? For just dollars a day, the Pacifica can be yours, so please, don’t leave it out in the cold sad and lonely. Can’t you see the poor sad puppy dog eyes your Pacifica has? Come see our selection of Pacificas and just like a puppy, your kids will be begging you to take it home. Please mom, please mom! Can we please take the cool Pacifica home? We promise we will take good care of it. And even if they don’t, no worries because the Pacifica has a built-in vacuum! Come see us today and bring home your adopted Pacifica that will awe and delight the entire family. Szott M59 Chrysler Jeep has the perfect new Chrysler model for you. Find it here, along with Highland’s best service and value. Get it all today. Buying a vehicle is a special experience. We understand that this isn’t something our customers do every day, which is why we treat every interaction with the respect that it deserves. Szott M59 has loyally served the Highland market for decades because we believe that the community and its people supersede any expectations set by a corporation. This is your community. This is our community. When you are shopping for a new or used car like a Jeep model, you expect the experience to match the promise, which is why we are open and transparent every step of the way. Below, you will find more information about the new Chrysler Pacifica. We hope that you’ll contact us and allow us the opportunity to show you why buying from the pros at Szott M59 Chrysler Jeep, is simply the best decision you can make. There’s more to a vehicle demonstration than picking out colors and taking a test drive. At Szott M59 Chrysler Jeep, we want you to know everything that’s important to YOU in your next new vehicle. 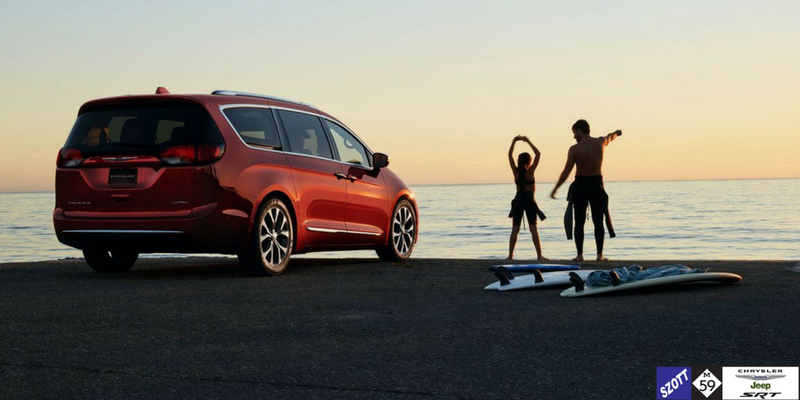 The new Chrysler Pacifica is uniquely positioned in the Highland market to satisfy the needs of practical fun lovers everywhere – the Pacifica has the proper mixture of reliable performance and sublime comfort that’s appealing to families in White Lake. Our team is here to make sure you’re aware of every feature, tip, and maintenance best practice because we take pride in delivering the ultimate shopping experience for our customers. Watch this video to get your engine revving for your new Pacifica, and then let the pros at Szott M59 take care of the rest. We know you have many options when it comes to car dealers in the Highland area. Our hope is that you will give us the first opportunity to earn your business because of the tremendous experience, great pricing, exciting Chrysler selection, and our commitment to making your buying experience the most positive one you’ve ever had when shopping for a vehicle. We stand behind the ideal of delivering the type of respectful engagement that the people of Highland deserve. If you give us the first opportunity, you’ll see why our customers come back time and time again.